I can take or leave cauliflower. Most of the interesting ways to cook it depend on cheese, so when I get one in my organic box I usually turn to Indian recipes. I read Susan’s fat free vegan blog avidly and am a great admirer of her writing and her photography skills. But somehow, I don’t make too many of her recipes. Maybe my brain subconsciously kicks back at the thought of fat free food? Anyway, this recipe for cauliflower combines it with dal, which is one of my favourite things. For once I was delighted to see a cauli in the veg box! I won’t go into panch phoran here as Susan does it very thoroughly on her blog. I bought some on a whim quite a while ago but it’s been in an airtight jar and still smelt nice and fresh – just to be sure I added a little more than the recipe called for! As per usual I upped the chili level a bit and could have added even more. But overall I was very pleased with the dish. 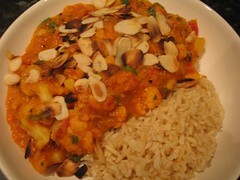 I stirred in a bit of chopped coriander and added some toast sliced almonds to give a little crunch. So don’t look at that cauliflower in despair next time! This entry was posted in Curry by efcliz. Bookmark the permalink. ooh, that looks nice! I’m still looking for panch phoran, but when I find it I’ll know what to do now.